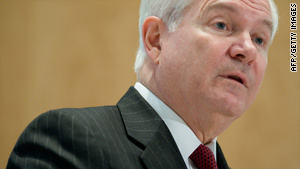 Defense Secretary Gates is moving toward ending the "don't ask, don't tell" policy. Obama directed Gates to consider how to end "don't ask, don't tell"
Washington (CNN) -- A Pentagon study on how to implement a plan to allow gays to serve openly in the military, "can only be successful if it is managed in a way that minimizes disruption to a force engaged in combat operations," according to Defense Secretary Robert Gates. Gates made the comments in a letter sent Tuesday to the four service heads and other senior staff who will work on a study looking at implications of repealing the "don't ask don't tell" law. President Barack Obama requested that the Congress repeal the law and directed Gates to consider how best to implement a repeal. The letter by Gates included an outline with objectives for the study and how to approach executing it throughout the services. In a reference to the delicate nature of the study, Gates also told members of the study group to, "In an appropriately balanced manner, engage Members of Congress, key influencers of potential service members and other stakeholder groups that have expressed a view on the current and perspective policy." Members also will work with the military-oriented think-tank Rand Corporation to update the 1993 National Defense Research Institute report on "Sexual Orientation and U.S. Military Personnel Policy: Options and Assessment," according to the Gates letter. The original 1993 Rand study concluded that the majority of the population did not approve of homosexuality and that the public attitude about gays serving in the military was similar. However, senior military officials have said that attitudes among troops about serving with openly gay service members have relaxed and many now do not worry about serving along side homosexual troops. To prove the more relaxed attitude for the Gates study, an anonymous survey will be given to troops to voice their attitudes toward the possible repeal of the law, Navy Secretary Ray Mabus told a Congressional panel last month. The Pentagon review is the first since the Congressional law took effect in 1993 banning service members from acknowledging they are gay. The final report is due to Gates on December 1, and then will be presented to Obama. On Wednesday key members of the Pentagon study will testify before the House Armed Services Committee to discuss the review. Policy watchers will be looking at how this study plays out. One of those groups, the Palm Center, is a think-tank that does research in the areas of gender, sexuality, and the military. In a statement released Tuesday the organization suggests that Congress tends to accept the advice of military leaders even if there is little evidence to support that advice. "We are concerned, however, that political leaders seem poised to accept advice provided by the Service Chiefs uncritically, advice which does not seem to take into account considerable research that has emerged over the past fifty years about the impact of openly gay service on military effectiveness," according to the statement from the Palm Center. "Acting on advice which is not grounded in data would be inconsistent with the tradition of civilian control of the armed forces," it said. But there are a number of skeptical members of Congress who oppose the repeal of the policy. A number of Republican senators say they worry about a change in the law. They say it could undermine morale, disrupt unit cohesion and possibly affect recruiting, a touchy subject to many when the military is fighting two wars. One of the most vocal critics of repealing the law is Senator John McCain, R-Arizona. At a hearing last month he voiced his concern. "Has this policy been ideal? No, it has not. But it has been effective," McCain said.